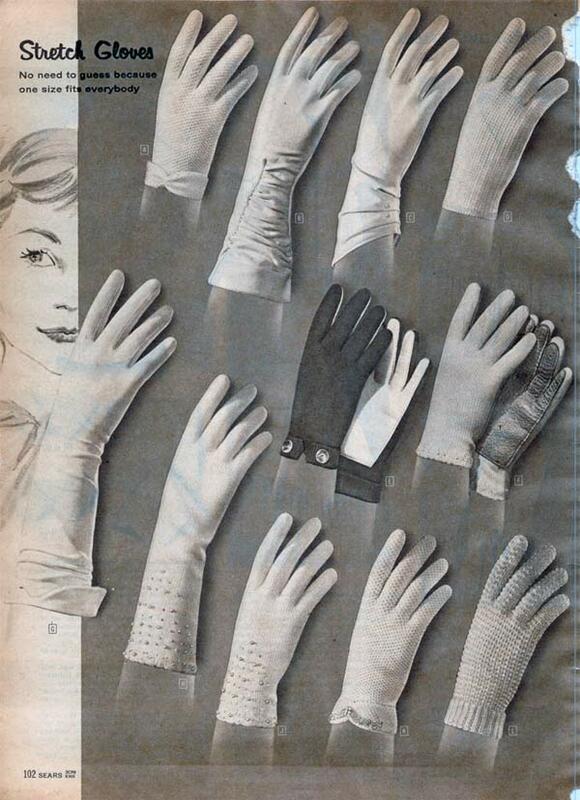 Gloves played an important role in 1950s fashion. 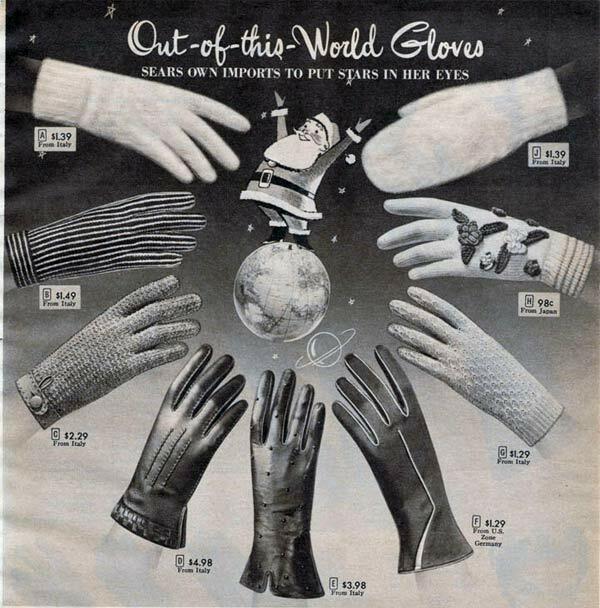 Although glove sales weren’t quite what they used to be, they still sold well and most women had a few pairs to choose from. 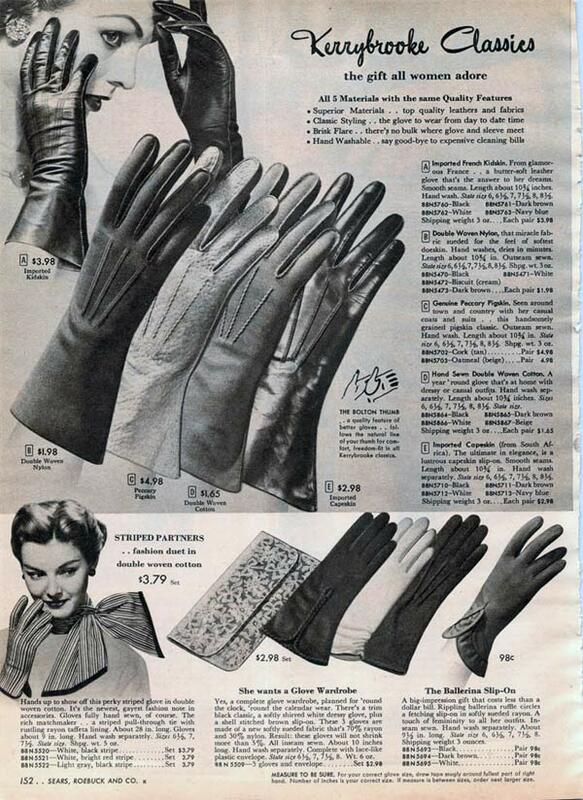 In the late 1950s, women wore long, white gloves when they wanted to look ultra-fashionable and glamorous. This look was later popularized by Audrey Hepburn in the 1961 classic, Breakfast at Tiffany’s. But white wasn’t the only color. Some women took it the next step further and wore gloves that matched the color of their outfit. 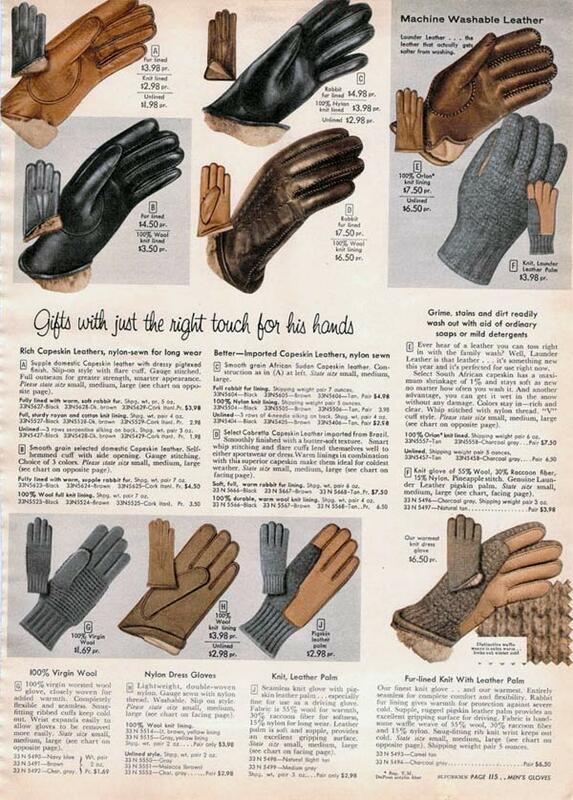 Of course, beyond fashion, people wore gloves to warm their hands. Cars didn’t warm up as quickly as they do now, which meant that most of the time the entire drive into town without gloves meant freezing cold hands. 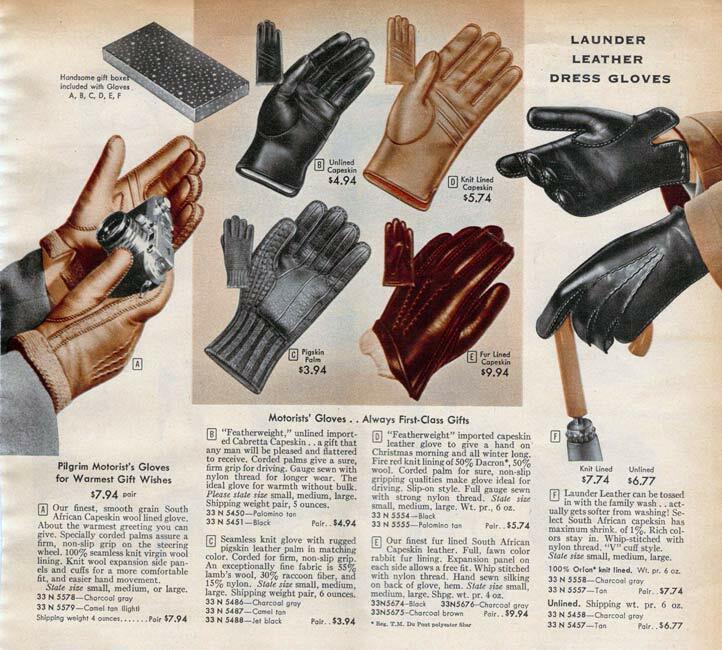 For the utilitarian, leather was the popular choice, using pretty much any type of animal that you could imagine. 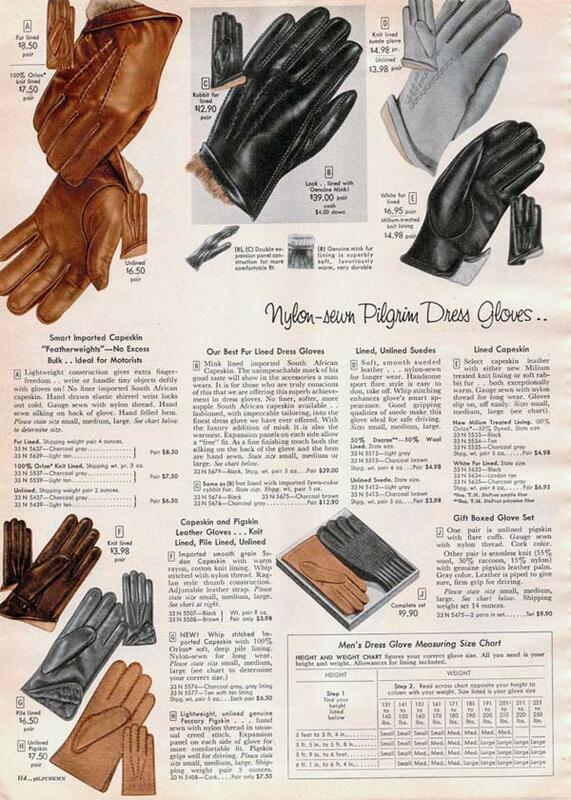 Deerskin, cowhide, and sheepskin were common leathers. 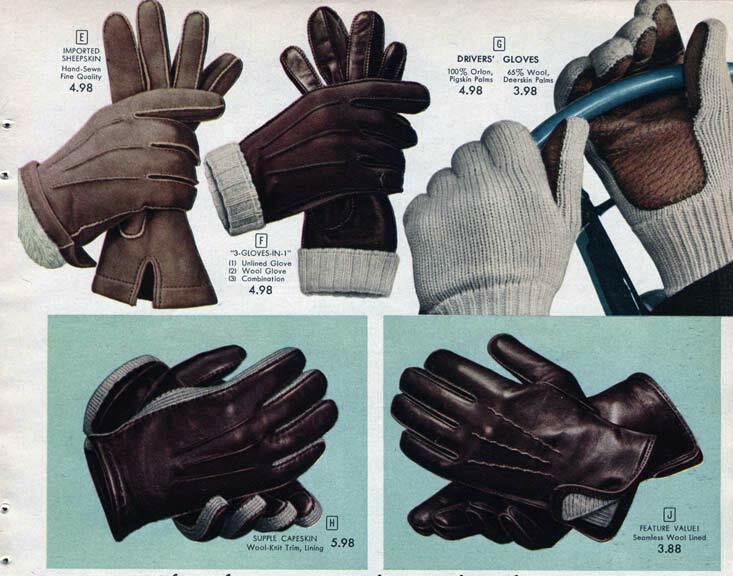 If you don’t mind the gloves being a little bulkier, or if you need them to be a little warmer, you can get them lined with rabbit fur. Women especially had a wide variety of patterns and styles to choose from. Striped gloves sometimes came with matching scarves. 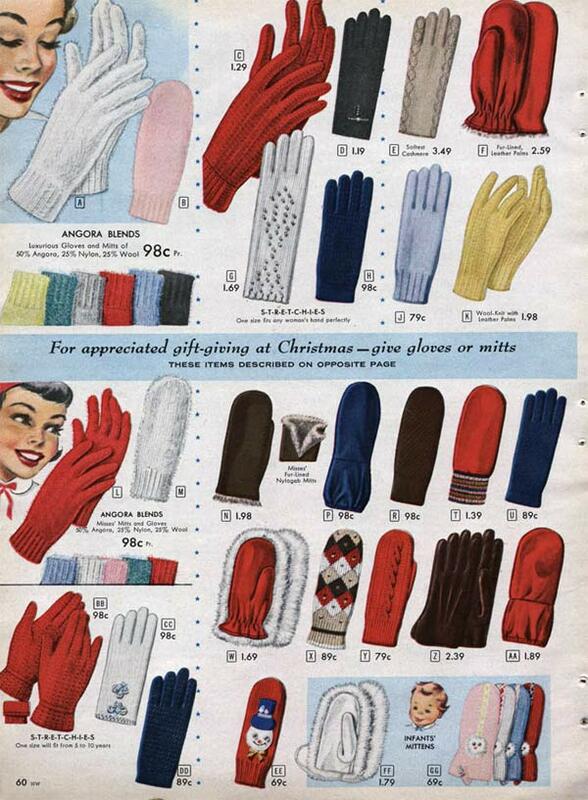 Mittens were also a very popular. 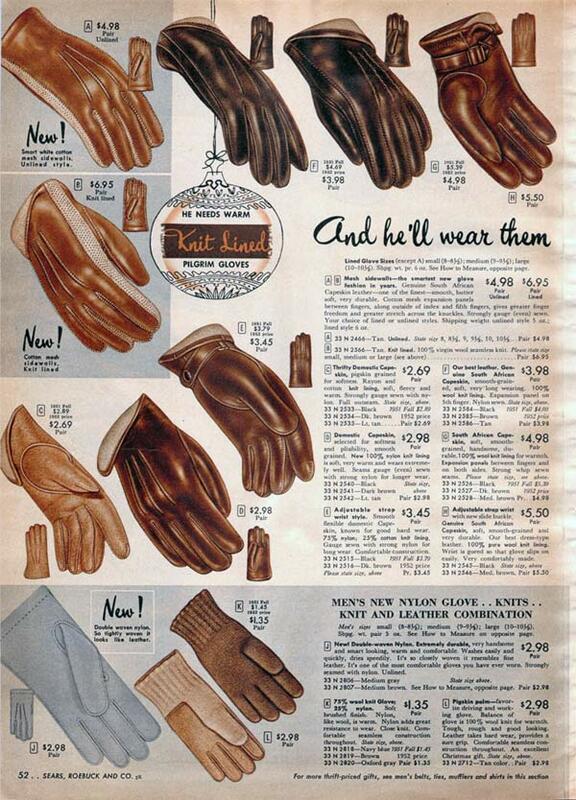 For men, the leather glove was almost the only choice. 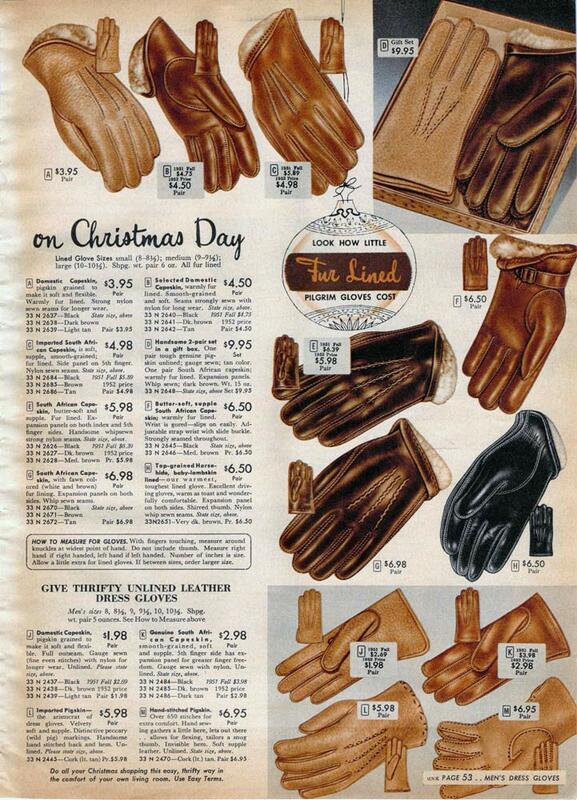 There wasn’t much variety in the color of glove either: black and brown were pretty much your choices. 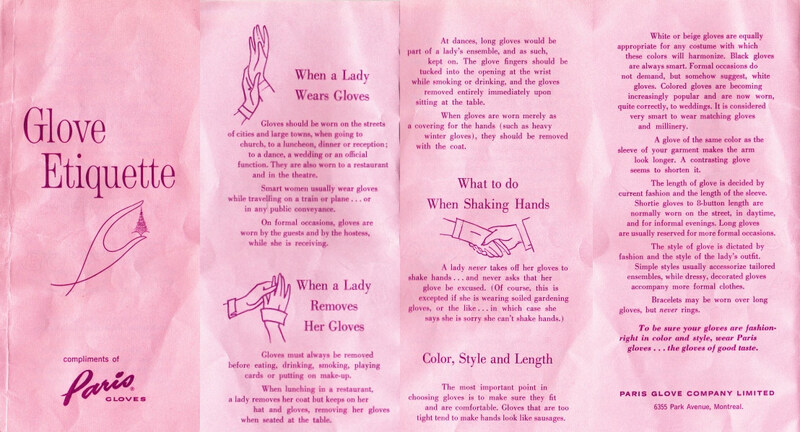 Gloves should be worn on the streets of cities and large town, when going to church, to a luncheon, dinner or reception; a dance, a wedding or an official function. They are also worn to a restaurant and in the theater. Smart women usually wear gloves while travelling on a train or plane … or in any public conveyance. Gloves must always be removed before eating, drinking, smoking, playing cards or putting on makeup. When lunching in a restaurant, a lady removes her coat but keeps on her hat and gloves, removing her gloves when seated at the table. 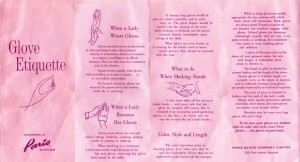 At dances, long gloves would be part of a lady’s ensemble and as such, kept on. 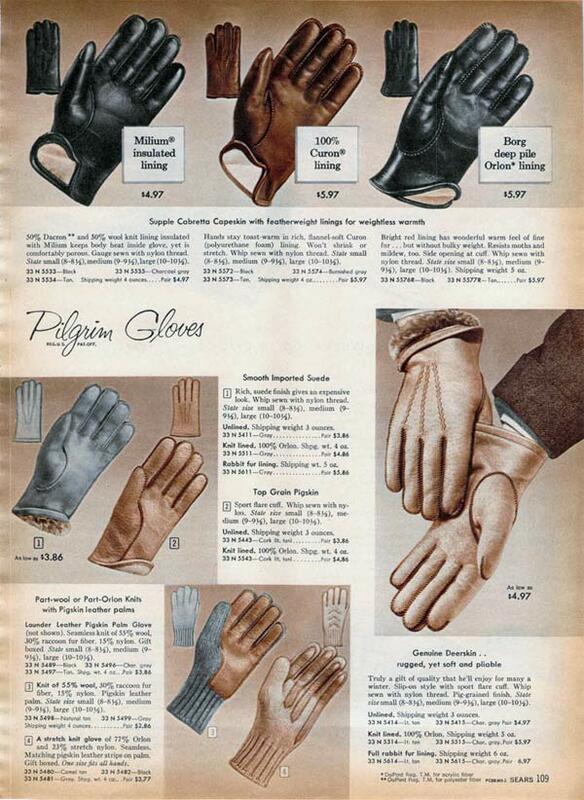 The glove fingers should be tucked into the opening at the wrist while smoking or drinking, and the gloves removed entirely immediately upon sitting at the table. 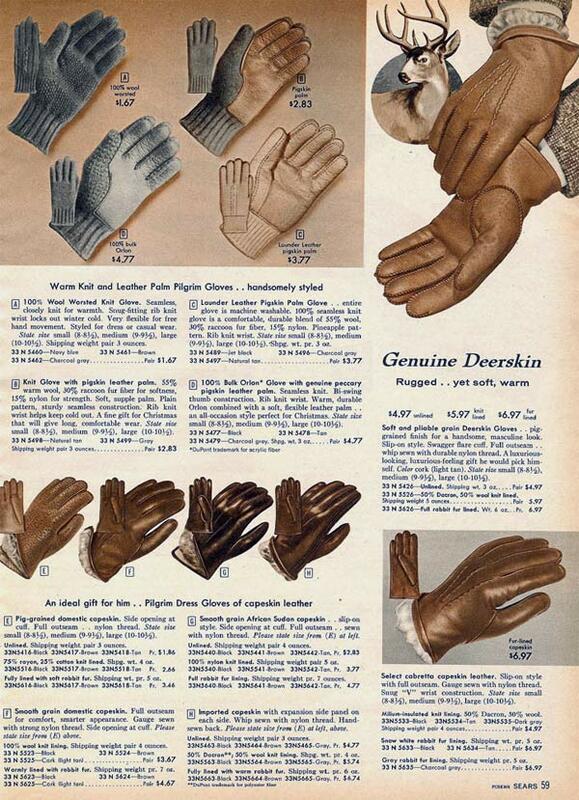 When gloves are worn merely as a covering for the hands (such as heavy winter gloves), they should be removed with the coat. 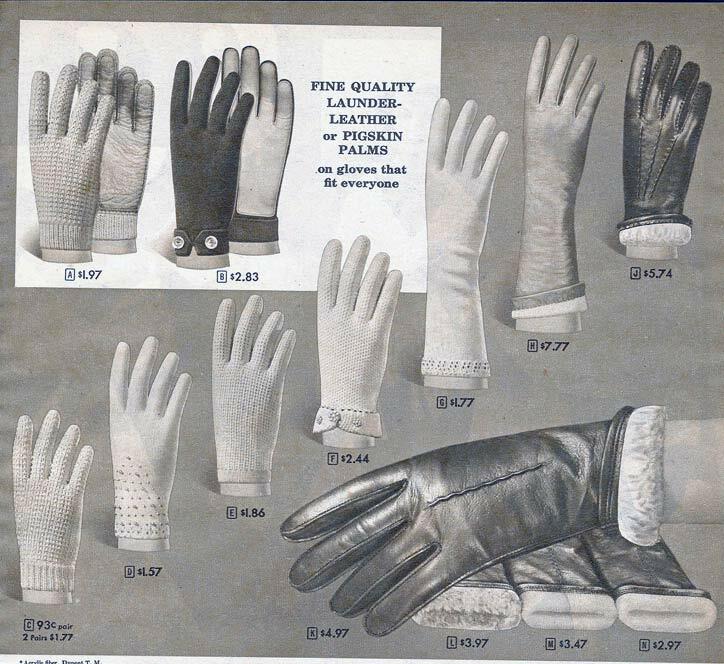 The most important point in choosing gloves is to make sure they fit and are comfortable. Gloves that are too tight tend to make hands look like sausages. 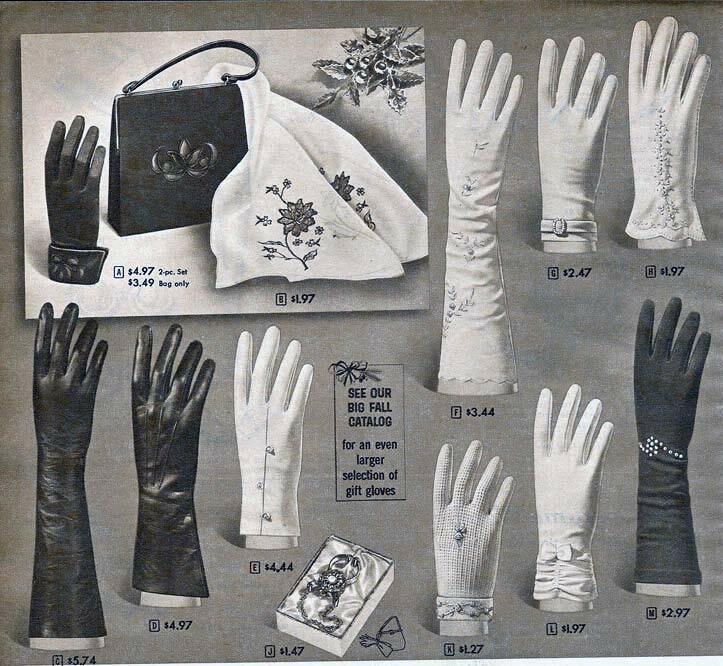 White or beige gloves are equally appropriate for any costume with which colors will harmonize. Black gloves are always smart. Formal occasions do not demand, but somehow suggest, white gloves. Colored gloves are becoming increasingly popular and are now worn, quite correctly, to weddings. 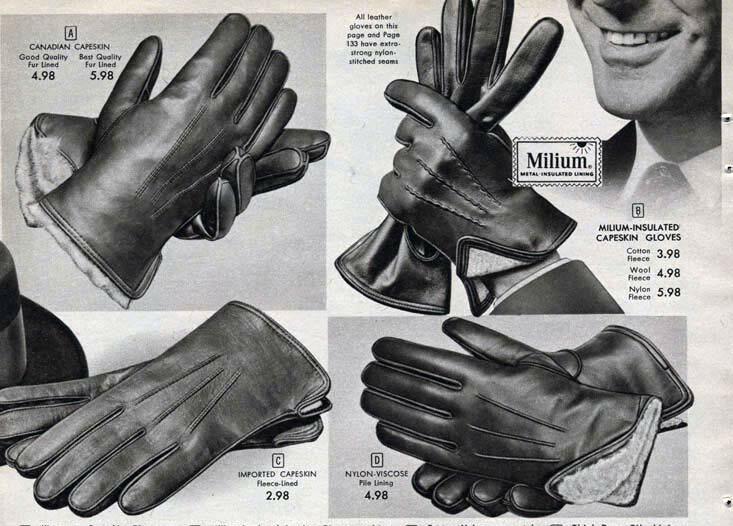 It is considered very smart to wear matching gloves and millinery. 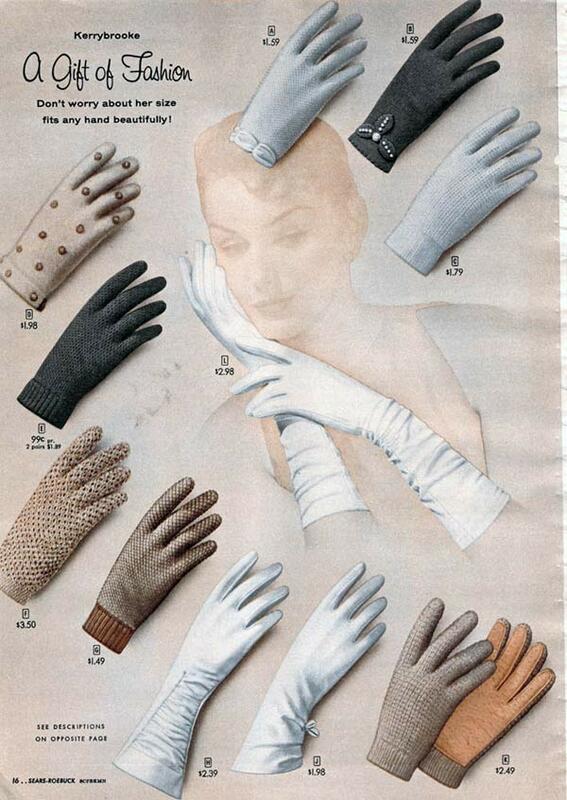 A glove of the same color as the sleeve of your garment makes the arm look longer. A contrasting glove seems to shorten it. 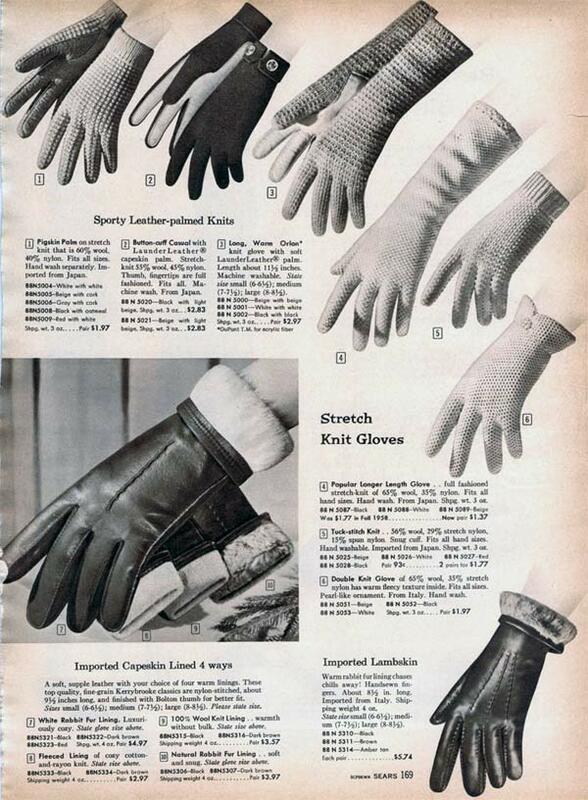 The length of the glove is decided by current fashion and the length of the sleeve. Shortie gloves to 8-button length are normally worn on the street, in the daytime and for informal evenings. 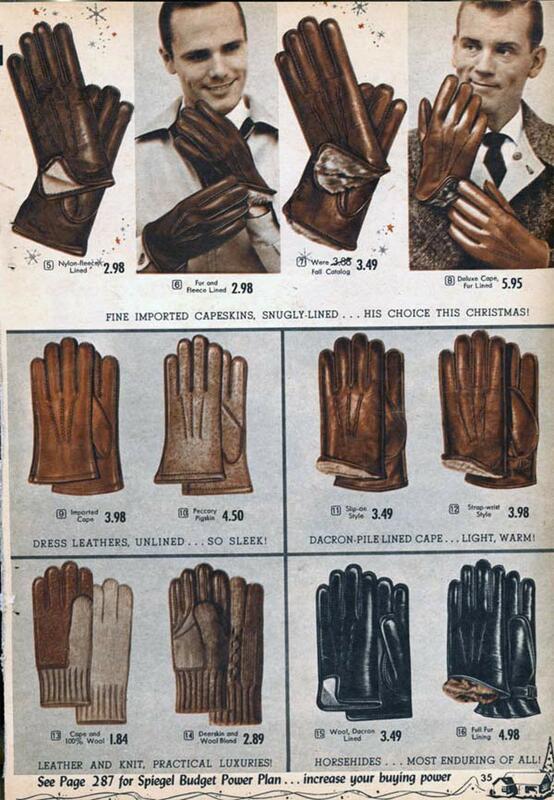 Long gloves are usually reserved for more formal occasions. 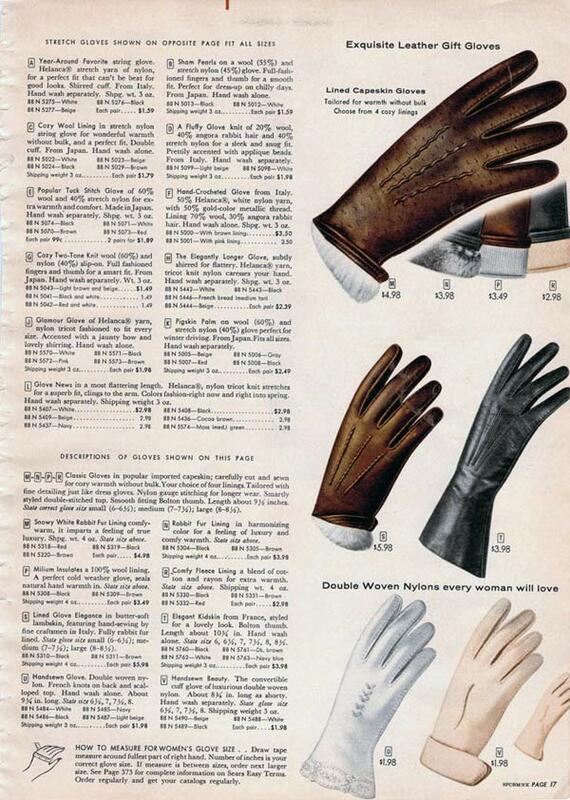 The style of glove is dictated by fashion and the style of the lady’s outfit. Simple styles usually accessorize tailored ensembles, while dressy, decorated gloves accompany more formal clothes. Bracelets may be work over long gloves, but never rings. 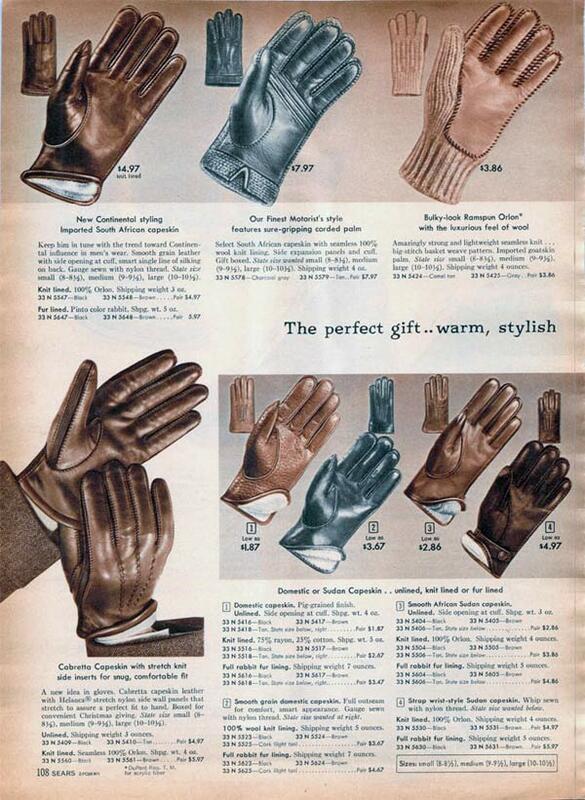 Scroll down for pictures and catalog scans featuring a wide variety of glove styles from the 1950s.